I just realized several of my favorite wishes. Visiting Artsakh - the Nagorno-Karabakh Republic. I love long journeys. On a plane, train, car.. whatever. I always enjoy the way, the process of getting into the destination. Especially having things to do (listening to music, reading, writing etc) or people to chat with. When the way is longer than the stay, you have no choice but to enjoy it, otherwise - it's not worth the time spent. This time we managed to travel to Artsakh and back in 2 days. It was very intense. Too many hours of rapidly changing scenes, new places, experiences and feelings. But I've enjoyed it all. 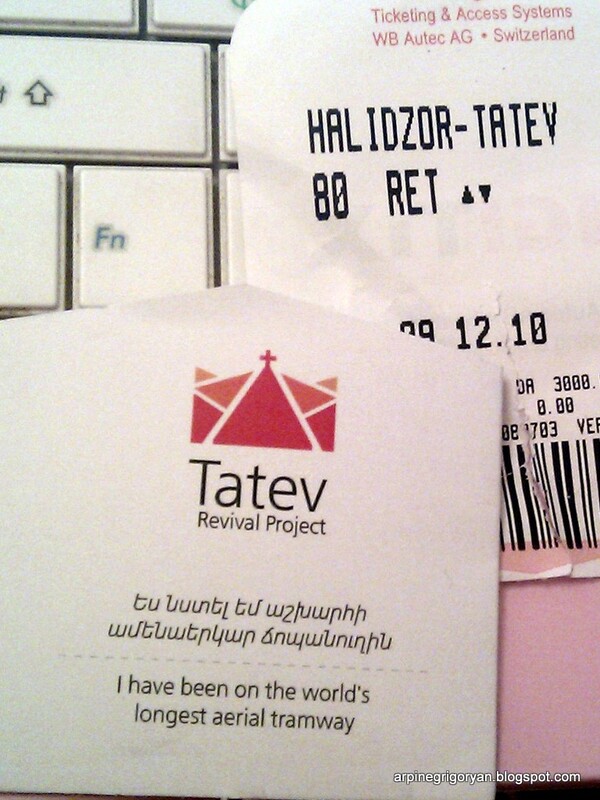 I've always felt myself something between retarded and underprivileged for the fact that I've never been to south of Armenia (further south than Noravank) and never been to Tatev Monastery. Now I feel special and quite privileged. I have been on the Guinness certified world's longest aerial tramway "Wings of Tatev" only couple of weeks after the opening. The aerial tram was quite nice, not scary at all. The journey is 11-15 minutes long and the highest point is about 300m. The tram can fit 25 people at once and when we were there, it was full with villagers who are allowed to travel on it for free. 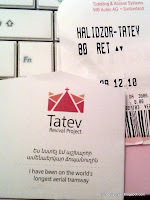 Then we arrived to the Tatev Station. ...and I finally saw it. One of the most magnificent sites in Armenia. It was nice to see many restoration works being carried out there. They were restoring the old oil mill and visitors had the chance to see a 3D model presentation of how it used to work. A friend of ours who was there a week before, had told us not to miss the cafe that is located inside the Tourist Information Office near the monastery. Yeah, just like that. Why not? :) By а strange but pleasant coincidence we met our friend right there, while trying to locate that Info Office. There we had an amazing homemade dinner in a cozy atmosphere, then some great gingerbread-like cookies. Then we traveled back to Halidzor station on the last tram for the day (departing 17.30). And then we continued our trip to Artsakh. I am very grateful for this information and valuable pictures ... at least now I know an idea for your beautiful country Armenia.